We have a staircase down to the basement that’s not really good for much (as far as decorating goes). On the week you’re doing Jack and the Beanstalk, though? It’s perfect. 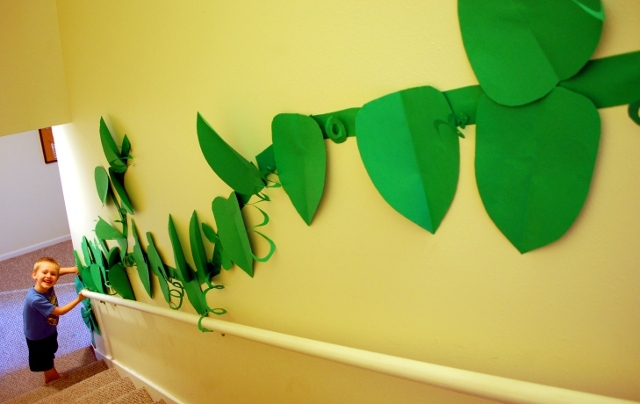 This beanstalk was made with 50 sheets of green paper, some tape, and a lot of giggling. It’s an example of the whole transcending its component parts: the stem is just sloppy rectangles taped together along the handrail. The leaves are only vaguely leaf-shaped. The vine tendrils are spirals cut out of the scraps left over from the leaves. But all together, on the wall, you have magic. 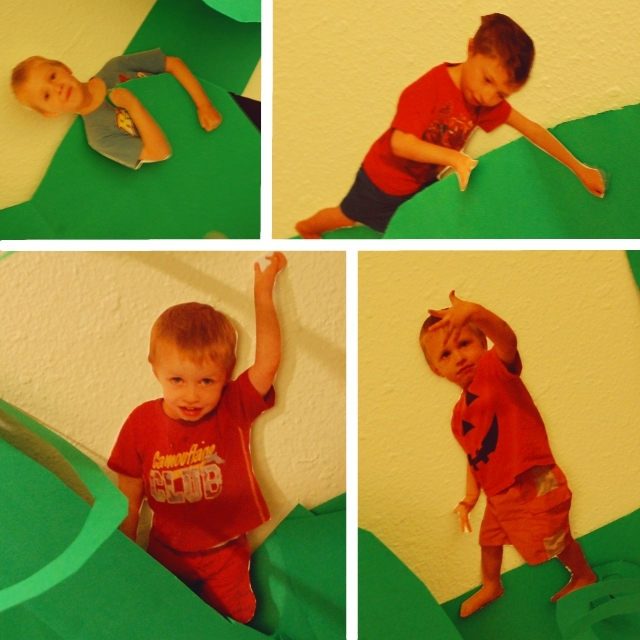 four little hooligans climbed the beanstalk. How much fun is that?! Not bad for five dollars of green paper and some tape, right? Quick! While it’s fresh in their heads – plant some pole beans at the base of the deck. They grow so fast you can literally almost (interesting phrase ) see it and fresh green beans will spoil you for canned or frozen in a heart beat. This is sooo cute! I wish I had a staircase to do this we planted the beans and the kids really got into that but this is such an awsome idea.